“The victory march will continue until the Palestinian flag flies in Jerusalem and in all of Palestine”- Yasser Arafat. 30th March is a historic day in the Palestinian history because this day commemorates the Land Day: the first widespread struggle of Palestinians against the Israel. After the establishment of the state of Israel, it was the first common struggle by the Palestinians. Since1976 it is celebrated as the Land Day. On this day Palestinians had organized a general strike and march from Galilee, and the protest spread to the occupied west bank, Gaza and refugee camps in Lebanon to condemn the Israeli plan to confiscate the Palestinian land in order to create a Jewish National Home. In the confrontations with the Israeli army and police, six Palestinian were killed, about 100 wounded, and 100 arrested. Later confidential document called Koenig Memorandum written by Yisrael Koeing (then a member of the ruling party) was leaked in the media which recommended to “ensure the long-term Jewish national interests” it stressed the need to "examine the possibility of diluting existing Arab population concentration". This year the land day was marked by Global March to Jerusalem (GMJ). A distinguished group of 400 advisers, including Archbishop Desmond Tutu; Nobel Laureate Mairead Maguire and Swami Agnivesh, former member of Indian Parliament promoted the GMJ. The objective of GMJ was to call attention to continuing Judaisation of the Palestinian land, demanding freedom for Jerusalem, its people, and to put an end to the apartheid regime and ethnic cleansing. GMJ had been a courageous and marvelous endeavor to encourage the world’s conscience on Palestine. It was a first time in the World history, people from all over the world came together against such a powerful oppressor. It was a unique effort by the citizens of different nations for the people of Palestine. Individuals from different religions, regions, language, race even Jewish organizations (like Jews for Justice for Palestinians and Independent Jewish Voices) came out to support the campaign. GMJ was an initiative to unite the Arabs, Asians, Europeans, Christians, Muslims, Jews and all peace loving citizens of the world to put an end to the Killing Machine (Israel). Israel has proved that International Laws are not meant for them because of their close alliance with US as they can get away with any war crime. Israel is a living example monarchic system of UN. Keep aside other laws they are not even bound by International Humanitarian Laws. No need to investigate the history to prove Israeli atrocities as Gaza was recently under attack. On 3rd and 4th June 2012 night Israel carried out a series of air raids hitting several areas in the Gaza Strip. One house was struck by four missiles (1) . Governments and Institutions are bounded by their national or vested interests and they cannot afford Israeli rivalry. As ex-prime minister of Israel Ariel Sharon rightly said “We, the Jewish people, control America, and the Americans know it ”. (2) Since UN, US and other governments were tongue-tied subsequently ordinary citizens took charge to lend a hand to Jerusalem and to demonstrate to the Israel that peace loving people of the world are against it. All over the world different initiatives have been taken by civil societies and public in general against the Israeli state. The GMJ marched as close to the Jerusalem as they could, at the border of Jordan, Syria and Lebanon, at the checkpoint of Gaza and in the west bank, also in 32 countries and 54 cities at the Israeli embassies around the world. It was the first time in history that so many people gathered around the Palestine. All the protests were peaceful, keeping in mind Israel’s atrocious reaction on Al Nakba day 2011, when 13 refugees were killed. GMJ was initiated by Asian People’s Solidarity for Palestine (APSP); nearly 150 representatives from 14 Asian countries namely, Indonesia, Malaysia, Philippines, India, Pakistan, Afghanistan, Iran, Iraq, Azerbaijan, Tajikistan, Bahrain, Saudi Arabia, Turkey and Palestine participated in the convoy. 37 Indian delegates represented the vast diversity of the country and participated in the caravan. The caravan left on 9th March 2012 after a send-off ceremony at Raj Ghat by Zuhair Hamadallah Zaid, Minister/Deputy Chief of Mission (Palestinian Embassy, Delhi) and Ram Vilas Paswan. Indian delegates joined the Pakistani, Indonesian, Filipinos and Malaysian delegation in Karachi. Caravan faced several difficulties in terms of the Asian land route because of the increasing political intricacy in Syria. Therefore the Asian convoys detoured Syria which generated several problems in terms of the land route and the finance. Caravan covered nearly 15000 kms of distance by bus and ferry in 25 days and more than 30 programs took place in 20 cities of 3 countries in which 10,000 people participated. No doubt this march was interesting with lot of learning experience but it was not that painless and entertaining as it seemed. Caravan dealt with several troubles ranging from visa problems to lack of sleep and harsh weather. The major problem which caravan confronted with was the detention of 37 Indian, 3 Filipinos and 1 Iraqi delegate for 36 hours in a 426-seater small ship on 28th March at the Beirut port after travelling for more than 10 hours from Tusucu, Turkey. Nobody was allowed to step out from the ship by immigration authorities. There was no supply of drinking water, food and proper sanitation. The food which delegates and ship’s kitchen was carrying got finished. After protesting, authorities provided some food and drinking water and the next day Indian Embassy delivered some fresh food. Lebanese immigration authorities collected all the passports and were not giving any information about the visa procedure. While the Caravan was leaving Turkey for Lebanon, GMJ media group got the information on 23rd March that “Israel issued a warning to the nearby Arab states (Syria, Lebanon, Egypt, Jordan , Hamas’ in the West Bank and to the Palestinian authority) if they allowed the global march to take place next Friday 30th March. Israel also stated that if anyone neared their borders, they would be accused of trespassing . (3)” But this news did not deter the morale of the delegates. Indonesian delegates got their visas after their embassy’s intervention. Iranians, Malaysian and Turkish do not need visa to enter in Lebanon. It was assured that delegates would be issued visa on arrival as per norm. But Indians couldn’t get visas until the intervention of Indian Embassy. Several political leaders intervened in the matter. N. Kiran K. Reddy, Chief Minister of Andhra Pradesh asked the State Congress Members of Parliament to discuss the issue in Rajya Sabha. Afterwards, MPs of Telugu Desam Party demanded India’s intervention on the issue in Lok Sabha. Mani Shankar Aiyar, Congress MP called the Indian ambassador Ravi Thapar in Lebanon. Somehow Indian government and Ambassador were able to get the visa for Iraqi and Filipinos along with Indians at 12:30 am on 30th March. At last, the delegates from Europe and Asia gathered at the La Opera Suites in Beirut to give the loud and energetic welcome to the Indian, Iraqi and Filipino delegates. It was a happy reunion. Eventually, on 30th March morning Caravan joined the hundred of Palestinian refugees and Lebanese gathered for demonstration at Al-Shqeif Castle in Southern Lebanon, overlooking the borders with Palestine. People were very enthusiastic and vigorous. Everybody was waving the Palestinian flag, showing photos of their martyrs and wearing Arafat’s Kufiyyah. Old women were crying and hugging us as if we were the warriors, young ladies wanted us to click photos with them and children were trying to touch us. The atmosphere was very moving and poignant. To avoid occurrence of violence, Lebanese and Israeli security were present on both sides of the border. Highlights of the demonstration were the children who sung Palestinian patriotic songs and four Rabbis from anti Zionist group called Neturei Karta like Yisroel David Weiss said “We want the world to know that the Jewish religion does not accept the occupation and the oppression of the Palestinian people. It is against the Torah, the Jewish teaching. It is against the views of Jews around the world who are true to the Torah.” Feroze Mithiborwala from India represented the Asian Caravan. Similar demonstrations also took place in Syria, Jordon and Palestine on the same day. In Palestine, a 20 years old boy was killed in Beit Hanun by Israeli troops and more than 100 protesters were injured at Qalandiya checkpoint during the protest. The march successfully came to an end and was followed up by felicitation programmes in several participating countries including cities like Delhi, Mumbai, Lucknow and Jaipur in India. 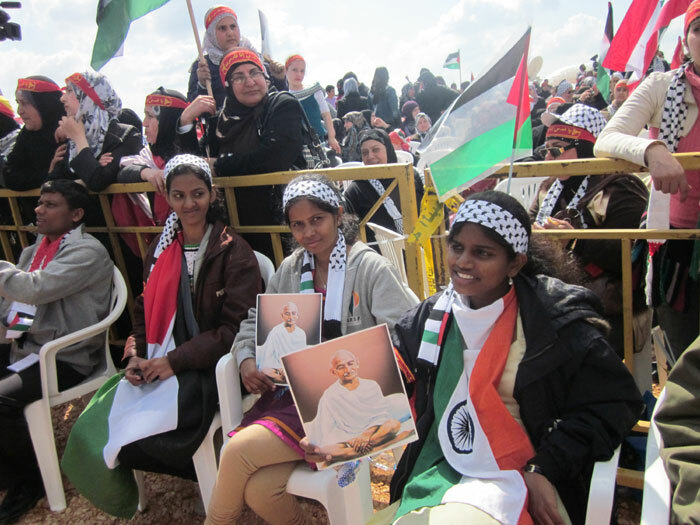 Our Caravan was a small effort to show Gandhi’s stand on Palestine to the Israel. In the entire Caravan, Indian delegation was the only delegation representing vast diversities. All over the world Palestine issue is considered as a Muslim issue but people were impressed to see that Hindus, Atheists and Seculars are also pro-Palestine. Indian delegation presented a good image of Indian Unity in Diversity but only the wearer knows where the shoe pinches. Now I am revealing the hard realities, why India took a 180 degree turn on Palestine matter; how Israel is sowing seeds of hatred between Hindus and Muslims and how the celebrated slogan unity in diversity has been continuously bombarded with Hindutva’s one nation ideology. Needless to say that since the year 1948, India is playing a game with Palestine, Indian Muslims and its national unity. In 1988 (and in Sept 2011 as well) India was the first non-Arab country to support Palestinian bid for statehood at the UN. Not only this, India also gifted a piece of land to establish the Palestinian Embassy in Delhi in 1980. At the same time it was also carrying out Pro-Israeli policies from 1950s. In the beginning, India was keeping Israel at bay and relationship with Palestine was flourishing because of the following reasons: it wanted to secure an access to Arab oil; it relied on money being sent back by Indian migrants working in Arab during the economic crisis in 90s; it wanted to maintain a strong relation with Muslim world so that they would not side Pakistan on Kashmir matter; it had a good relation with the erstwhile American enemy i.e. USSR; and because Israel was a creation of Westerners especially Britain. Automatically it also helped Indian government to gain the trust of Muslim minority. These reasons clogged the open Indo-Israel relations from 1948 to 1992. Another position from which India was backing Palestine was the fact that its greatest enemy also established its state on the basis of religion and Israel was following its footstep. But contrary to this, in 1971 war with Pakistan, India sought for Israel’s secret weaponry aid which was materialized by Mossad who was maintaining secret relation of exchanging military and intelligence without risking economics and political boycotts and protests by Arab world and Indian Muslims, respectively. In 1992 India formally established the diplomatic relation with Israel by sacrificing the unity and harmony of the nation. Itzhak Gerberg argues (4) that “Both countries (India and Israel) have adopted similar positions on arms control issues and Islamic radicalism (5) . No doubt, particularly in dealing with minorities as they have adopted similar strategies. First and foremost similarity is calling them terrorists. One can easily state that India has provided a testing ground to Israel to experiment their bigger agendas like demolition of Masjid-e-Aqsa. By some scholars destruction of Babri Masjid in 1992 was viewed as the trial of demolition of Masjid-e-Aqsa, but no one paid any attention to it as this type of news were published in Urdu media. Israel is repeating its heinous crime of so called “state cleansing” in alliance with some Indian fanatical organization. The way Israel hauled Palestinians from their houses and set them on fire, killed women, children and elderly and same pogrom was repeated in Gujarat in 2002. Their alliance is based on the ideology of ‘Hindutva Nation’ just like the Zionist concept of ‘Jewish Nation’. Bajrang Dal, Vishva Hindu Parishad and Bharatiya Janta Party (BJP) are close allies of Israel because they both see Islam as their mutual enemy (6) . 12 years ago, an article was published in Indian Express written by Sharad Gupta stating that “Desi Mossad is getting ready at Bajrang Dal’s Ayodhya camp. In that article, when an activist was asked what he did at the camp, he said “I am from the secret service of Bajrang Dal. Israel's Mossad is my inspiration. I can't tell you more ”(7) . Now, Bajrang Dal has opened a training camp at the Saraswati Bal Mandir School in West Delhi also. On 19th March 2012, The Hindu reported that Bajrang Dal activists allegedly bullying Christian Fraternity in South Delhi Slum. Narasimha Rao’s led Congress party government with Man Mohan Singh, then the Finance Minister granted full diplomatic relation to Israel to commence the economic reforms and liberalization, which demanded the changes in foreign policy. Although it was during the BJP rule, Indo-Israel relations reached to its peak. There are people present in Congress and other parties who shares and supports the Hindutva ideology, but Congress always plays on a safe side. On the other, hand Right Wing is very open about it. Another trick of Israel which is being played here is the negative portrayal of Muslims in media. Mossad has a full fledge department called ‘LAP (Lohamah Psichlogit) ’ (8) to carry out this task of psychological warfare. Under the banner of Exchange of Counter Terrorism Strategies, this is also one of the important skills India is learning. India’s strong anti Muslim attitude has failed to acknowledge the danger posed by Hindu fundamentalists. Media loudly screams on its first page that “Muslim terrorist arrested”. But not a single newspaper called Seemananada a ‘Hindu Terrorist’ or mentioned violence against Christians and Muslims as ‘Hindu Terrorism’. Media intentionally forgets that terrorist is a terrorist, neither a Muslim nor a Hindu. Now the question arises, why Israel chooses India for all its dreadful activities, it could have chosen western countries which supported (and still supporting) them to establish and expand an illegitimate state. Answer is: apart from strategic and geo-political reasons, one of the vital factor is that no matter how much galaxy of western countries supports Israel in establishing the Jewish state, but Israel is very conscious that western countries has their own vested interests in creation of non-Muslim country at the centre of West Asia. Another factor is, they have not forgotten the hostility and discrimination they faced of being Semitic origin in the western land. On the other hand, India is the only country where Jews not only enjoyed all equal rights but dominated the commercial life from the beginning and never known to anti-Semitism. This was the fabric of real India; tolerance, cooperation, co-existence and harmony which is now at stake. Jews and Muslim communities lived together peacefully in the same colonies for years. Let alone the present times, even they never confronted with any biasness at the time of Mughals. India is India because of its diversity, different religions, languages, customs, and traditions. As vegetables and fruits keep their identity distinctive, at the same time gets mixed into one bowl and makes a good salad. Just like that India cannot be India by following the ideology of Hindutva. On the Indian flag, if Green would be over-painted by Saffron then it would look like a stain. It is ridiculous that at international platform lunatic organizations and individuals display themselves as the citizens of the most diverse and tolerant country but at the same time they are trying to paint all India in one color. Indian unity and harmony is on the edge of devastation because of the alliance of Israel and extremist organizations. To save India from Israel is as essential as to save India from neighboring terrorist organization’s infiltration. 2. Israeli Prime Minister, Ariel Sharon, October 3, 2001, to Shimon Peres, as reported on Kol Yisrael radio. 4. Itzhak Gerberg is a former Consul-General of the State of Israel in Bombay (Mumbai) and former Ambassador to Zimbabwe. He is presently the Ambassador of Israel to Georgia. He holds a PhD in International Politics from the University of South Africa, and his doctoral research focused on India-Israel relations. He was an instructor at the Israel National Defense College (INDC).